You better start getting the book Ebay Ha Nachal out. Saba says that BEFORE the Moshiah is revealed the Book Ebay Ha Nachal will be very famous and loved (or something like that). Logically enough if this is not the case, then the Moshiah CANNOT be revealed! Both Saba and his student and "best friend" Israeli Minister of Education. President Zalman Shazar started respectivly two very successful publishing houses. The biggest Breslev Publishing house, and the biggest Israeli History publishing house. It is logical to understand that both these men had their precious book in mind. EBAY HA NACHAL. History has shown that NEITHER attached importance to this book. The people that have made a difference are ultimatly the salesmen who have direct access to the market. YOU and THE MARKET will determine the successful sale of this book and the coming of the Moshiah! 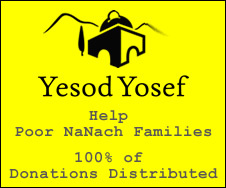 The publishing houses have not so far promoted the sale of EBAY HA NACHAL-- perhapse they need a big market push so please send in your suggestions on how to create this market push. what is the book Ebay Ha Nachal about and does it come in english and were can i get it? Ebay Hanachal is a collection of inspirational letters (to say th least) that Rebbe Yisroel Dov Odesser wrote to the president of Israel Zalman Shazar.